The Inca Trail with Sacre Valle Tour has been especially designed to include the Sacred Valley while giving your body a chance to acclimatize, avoiding problems on the already difficult 4-Day Inca trail. We follow the Urubamba River down through the Sacred Valley of the Incas, which is studded with Inca temples and palaces eventually reaching the start of the Inca trail. Here our experienced crew help make the camping experience more like a hotel stay. This amazing trail is an archeological feast culminating with the lost city of Machu Picchu. Following the mysterious Inca trail, discover its amazing buildings, enjoy the atmosphere of the Andes & make your own unforgettable experience! Day 1: CUSCO - SACRED VALLEY OF THE INCAS -OLLANTAYTAMBO. We will pick you up at the hotel at about 8:20 am. The Sacred Valley tour is a full day and includes the village of Qorao (where is possible to take beautiful pictures of the landscapes from a lookout site ). Visit to the picturesque Indian Pisac Market held on Tuesdays, Thursdays and Sundays, the shopping paradise of the Andes where barter is still practiced. we continue toward Ollantaytambo built to guard the entrance to this part of the Valley, and protect it from possible invasion from the tribes in the Lower jungle. You can walk through the quaint streets of the nearby Town, and get a good idea of what this Strategic Military, Religious, and Agricultural Centre was like during the era of the Inca Empire. After this tour you will be set in your hotel . Overnight at the Hotel in Ollantaytambo. You will be picked up from your Hotel in Ollantaytambo at 7:30am. Make sure you carry your original passport or ISIC card. Our journey from Ollantaytambo to Piskacucho takes approximately 1 hour. Piskacucho (also known as Kilometer 82) where the trail starts. At Kilometre 82, it is necessary to show entrance tickets, passports and (if paying a student rate) student card. Crossing the Urubamba River we begin our trek through typical dry forest area. We will walk around 6 km to Llactapata the first archaeological site on our journey. After lunch 4 kilometers of gentle uphill through farmland takes us to Wayllabamba and to our camp site. *Reservations must be made at least two months before your arrival in Cusco. Take note that the Inca Trail has limits on how many visitors may enter each day. For this reason, we suggest that you make your reservation as early as possible to secure your entrance on the day that you wish to do the trek. 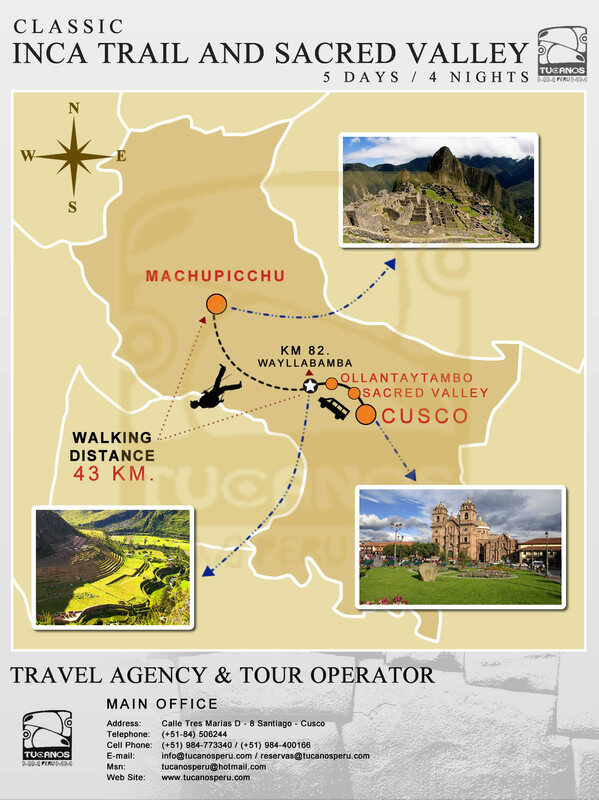 BOOK THE FAMOUS INCA TRAIL TO MACHU PICCHU AND GET ENJOY A FREE CITY TOUR OF CUSCO! When is the Inca Trail permits available? Permits to hike the Inca Trail go on sale at the beginning of February. There are 500 available for each day of the month. When you know your dates for travel, contact us to book your trek. The permit is for the first day that you start the Inca Trail. The permits for May, June, July and August sell out quickly. By the end of April, there are usually only permits available for September and beyond. Why do you need my passport number and birth date ? The Peruvian INC (InstitutoNacional de Cultura) requires the nationality, passport number and birth date of all persons buying a permit for the Inca Trail. Can I change the date for the permit? No, the permit is for a specific date. If you need to change your date, another permit must be purchased, and is based on availability. Can the permit be transferred to someone else? No, the permit is only for the person to whom it is issued. Is there student discount for the Inca trail permits? There are discounts available to Students with valid ISIC Student Cards and to young persons under the age of 17 years old ($45). Other student cards are not accepted by the park authority or at booking time. You most bring your student valid card and valid passport for the Inca Trail, without two documents or expired passport or student card you can’t do the Inca Trail. When the Inca trail is going to be closed? The Inca Trail is closed every February to clean and maintenance the trail, the toilets, the campsites and the bridges along the Inca Route. How is the weather on the Inca Trail? 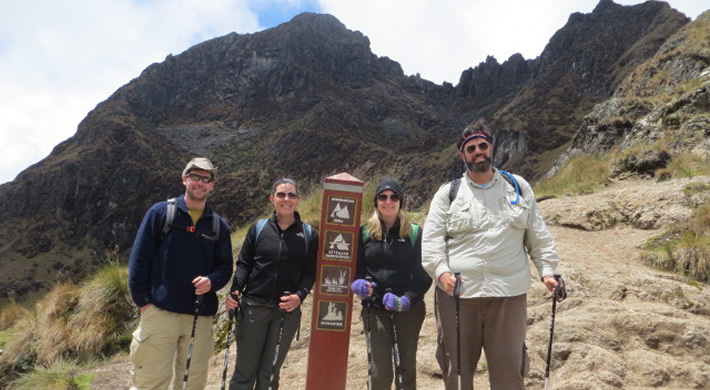 We recommend doing the Inca Trail Trek during the dry season, this is between May to November. Even the dry season is possible to get some rain in the Inca Trail. The rainy season in Cusco region (Inca Trail) is from December to May. How many people in the groups? Our groups are between 2-8 persons. we operate small groups and offer a personalized service. Most people have that concern but don`t worry. Only in extremely rare circumstances does a passenger need to come back early. You just need to remember that you are able to go at a speed that is comfortable for you. Take your time, pace yourself, and enjoy this awesome walk. The Inca Trail is considered a moderate hike. It's not a technical hike but there are a lot of Inca stairs to walk up and down, and the altitude may affect some individuals. We recommend using a trekking poles and have an early night before the trek. How high is the inca trail altitude? For the Inca Trail, the highest point is Warmihuanusca at 4200 m (13860 ft) and the highest campsite is Phuyupatamarka at 3650 m (12045 ft). What happens if we get sick or hurt and cannot continue on the trek? If someone in your group is sick, the guide will monitor that person to determine if rest is needed, a lower altitude is needed or if the person needs to return to the starting point or city for medical help. A trained assistant guide or porter will accompany this person back, if they can walk. Otherwise, the INC gives permission for horses to be used to evacuate someone. This person either gets medical help, or if he/she feels better, that person can join the group when it reaches Machu Picchu and Aguas Calientes. If there is a serious medical emergency, the guide will arrange for immediate evacuation of the individual to the nearest hospital. Can I have vegetarian meals? Our cooks can provide vegetarian meals no problem. Just let us know your dietary requirements when you book your trek. What About Trip Leaders And Tour Guides? Having a good guide is an essential part of having a good trek. Our guides are knowledgable in the areas of history, archaeology, ecology, and are natives of the Cuzco area. Will the guide have a first aid kit and oxygen? Yes, the guide will carry a first aid kit and have oxygen with them while hiking. It is a good idea for someone in your group to also have a first aid kit, with items that you normally need. Are there any facilities to use toilets? Yes, there are many toilets along the Inca Trail but very basic,when they are not available our team will set up portable toilet tents. About 70% of the people hired the services of a porter to carry their personal items. A personal porter can be hired for the 4 day trek (includes porters entrance fees, meals, transport and wages). If you hire the services of a porter you can give him a maximum of 7kg to carry which is usually sufficient for your personal clothes .The porter will not walk at your side during the trek so you will still need to bring a day pack to carry essential items. We will give you a duffle bag so that you can put your items into. This you will give to the porter on the day of the trek and return to us after use. We recommend that you purchase a 2 liters bottle of water to take with you on the first day. Every night during the trek, we will boil water so you can refill the same bottle every morning before setting out. If you are planning to drink from any streams or waterfalls, we strongly suggest you bring water purification tablets or filters. Also, you will be able to buy water along the way on Day 1 and Day 2 and of course at Machu Picchu. YES, so that you can take part in options such as bottle water/drinks,the natural hot springs in Aguas Calientes (10 soles), tips for your trekking staff, souvenirs, snacks in Machupicchu, drinks in your lunch in Aguas Calientes, etc. You should take at least 350 soles as emergency money. What do we do with our travel luggage while we are trekking? The hotel where you stay in Cusco will keep your luggage that you do not need. Most hotels have a locked storage room for your use. Most hotels also have a security box for a small fee. To avoid altitude sickness, give yourself time in Cuzco to acclimatize to the change in altitude. Two days minimum is recommended. Try to avoid alcohol before and during your trek, and make sure you eat lightly and drink plenty of water. Make sure to stay hydrated during the trek, don’t force yourself to walk faster than your body wants to, and take frequent breaks. Drinking coca leaf tea helps a lot, and you may wish to speak with your doctor about Diamox pills.